I don’t know why American’s don’t do eggs for dinner very often. Eggs are a great source of protein; they are extremely versatile and take very little work. Why are we not making eggs for dinner every night? Whenever I’m getting extremely low on groceries, or it’s the end of the week and I’ve eaten through my produce stocked fridge, eggs win it for the gold. One night my boyfriend and I were so exhausted and trying to figure out what to make for dinner. I convinced him we should just cook at home and save money, “I have eggs, spinach, cheese and bread. It will actually be a feast,” I said. He was too tired to argue so we came by to my house; I opened the fridge to reveal, I only had one egg to my name. I think I might have lacked bread as well. From that point on, I have had a very difficult time convincing him to eat eggs for dinner. But, this is a great meal for any time of the day (and maybe you enjoy it solo with a white wine spritzer and some classical guitar music – just an idea). Heat a pan to medium/high and coat with non-stick spray. Crack eggs next to each other directly into the warmed pan; season with salt/pepper and a little parmesan. Cover to lightly steam for 1 minute, and then fold the edges into the middle like a little package or a faux–omelet. Plate and set aside for a few moments. In the same pan, heat olive oil and sauté tomatoes until they begin to caramelize and soften, about 3 minutes. Sprinkle with salt/pepper and dried basil, smashing the tomatoes gently with a fork. 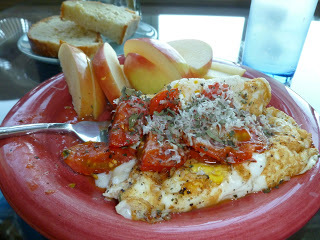 Transfer to your egg plate, placing the tomatoes on top of your folded eggs. Sprinkle with remaining parmesan.